Conor McGregor reacts to his first taste of defeat in the UFC after he was submitted by Nate Diaz. CONOR McGREGOR HAS vowed to take his defeat “like a man” after he suffered a shock loss to Nate Diaz in the early hours of this morning. McGregor was submitted by Diaz after four minutes and 12 seconds of the second round in the main event at UFC 196 at the MGM Grand Garden Arena in Las Vegas. Diaz stepped in to take the fight on just 11 days’ notice. McGregor was originally due to face Rafael dos Anjos but the lightweight champion was forced to withdraw due to injury. Dos Anjos was replaced by Diaz, with McGregor opting to take the fight at welterweight — 25lbs heavier than featherweight, the division in which he’s currently the champion. McGregor had the better of the first round but after being rocked by a big left hand from Diaz in the second, the Dubliner was left vulnerable and Diaz capitalised by forcing him to tap out to a rear-naked choke. 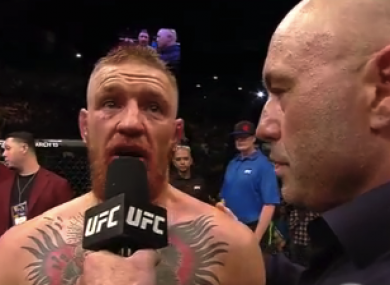 “I took the chance going in at 170 [pounds],” McGregor told UFC commentator Joe Rogan afterwards. “Nate came in, I felt I took him in the first round, but I was inefficient with my energy. “But I’m humble in victory or defeat. I respect Nate. He came in, he took the fight on short notice, he came in at 170 and done the job. He was efficient, I wasn’t efficient. That was it, I feel. Click here if you are unable to watch the video. Congrats to Nate and his team on a great win. Email “'I'll face it like a man, like a champion. I'll come back and do it again'”. Feedback on “'I'll face it like a man, like a champion. I'll come back and do it again'”.